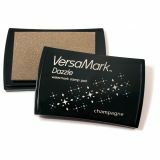 VersaMark Dazzle Watermark Stamp Pad - TSUKINEKO-VersaMark Dazzle Watermark Stamp Pad. Dazzle combines all the great qualities of the original VersaMark with added shimmer to give your paper projects an easy touch of elegance. Features: great for monochromatic and watermark effects, embossing and providing a base for chalks and pigment powders, heat set on glossy papers and brayer over with Memento dye inks for a shimmering resist effect, use on dark papers for a subtle sparkling image, excellent for background designs, water-based, archival quality, and acid free. Non-toxic: conforms to ASTM D4236. Imported.